The excerpt below is from the site of Apollo 17 Lunar Module Pilot and geologist Harrison “Jack” Schmitt, and it’s the most…well, invigorating description of a jump start I’ve ever read. This goes hand-in-hand with my article on the explosive guillotine in the Lunar Module because Schmitt describes an emergency scenario that Apollo crews planned for and practiced in which the launch sequence has failed: The guillotine has not fired, the four explosive bolts holding the two stages together have not exploded, and the ascent engine has not started. 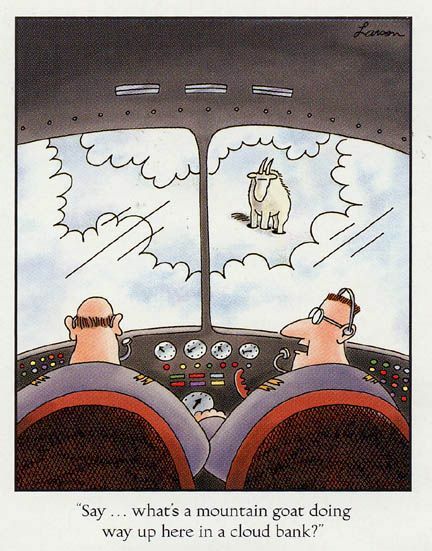 This is one of several contingency methods mission planners worked out. Bear in mind as you read Schmitt’s explanation that this would be happening after they had tossed their Portable Life Support System backpacks out onto the lunar surface to save weight during the ascent, and after they had closed up the LM and repressurized the cabin in preparation for departure from the lunar surface. It’s not often I find something about Apollo I’ve never heard before, and this one is boggling. I bolded the last bit of the excerpt because that’s the point when the ramifications sank in and my eyebrows shot off. Wednesday, November 8th , brought on our last full Lunar Ascent Mission Simulation involving Mission Control in Houston. Six weeks hence, we hoped we would be undertaking the real thing and departing the Moon at the conclusion of a highly successful exploration effort. This “Sim” required over three straight hours in LMS2, including the debriefing with SIMSUP (Simulation Supervisor). Failure or degradation of the primary guidance or engine ignition subsystems constituted the primary concerns addressed in Ascent Simulations. We particularly worked through several scenarios involving failure of the various software-initiated means of igniting the Ascent Engine. 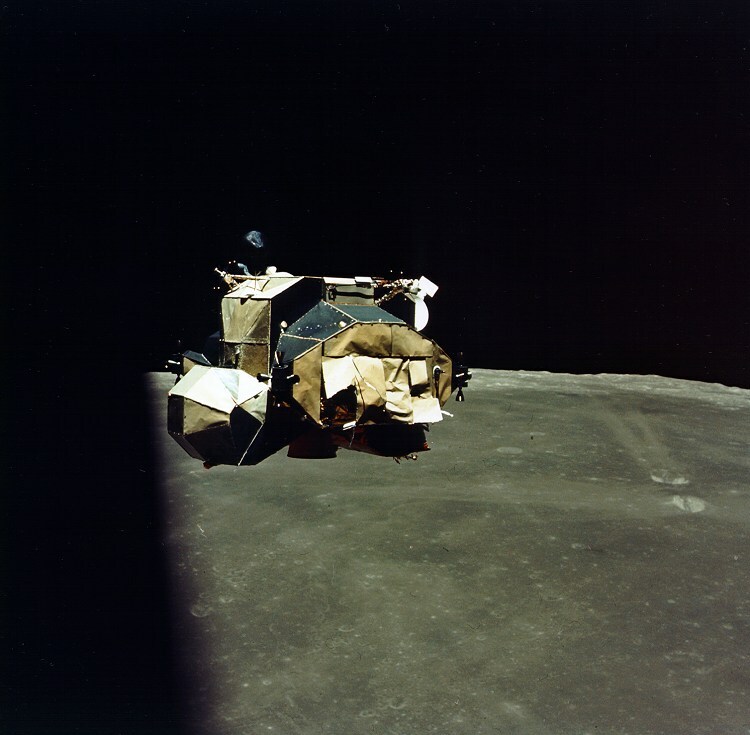 We did not have a great deal of concern about our Challenger Lunar Module, like all the others before it, having just one Ascent Engine, because, in fact, it was at least two engines that just looked like one. Only the solid metal fuel and oxidizer injector ring and the exhaust nozzle below that ring did not have identical, that is, “redundant” components that would function even if a primary component failed. No one could imagine a failure mode for these non-electronic and solid pieces of hardware. If all internal Ascent Engine ignition options actually failed, and many such options existed to fall back on, we also had a set of jumper cables that could be used as a next to last backup to ignite the Ascent Engine. 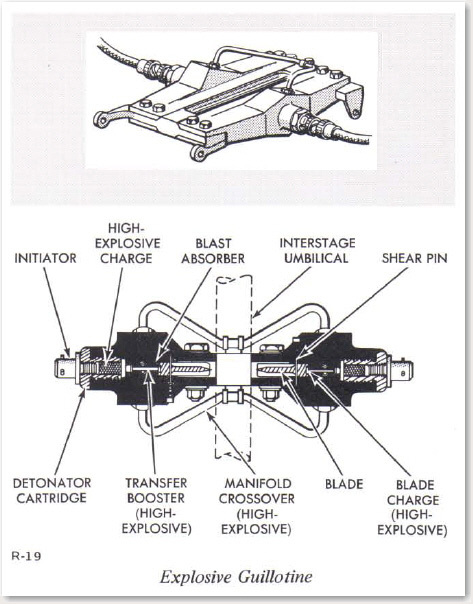 These were called the “ED/APS Emergency Jumper Cable” and would use power from an independent Pyrotechnic Battery in the Descent Stage to open the engine’s fuel and oxidizer valves and fire the pyrotechnic cable and bolt cutters that would simultaneously separate us from the Descent Stage. To use the second of these cables, however, one of us would need to egress Challenger in order to access a regular Descent Stage battery. Integrity checks of our suit would determine which one of us would perform this emergency EVA. If Cernan’s pressure suit did not pass its pre-egress checks sufficiently to permit egress with the jumper cables, we would change positions in the cabin, a tough task on its own. 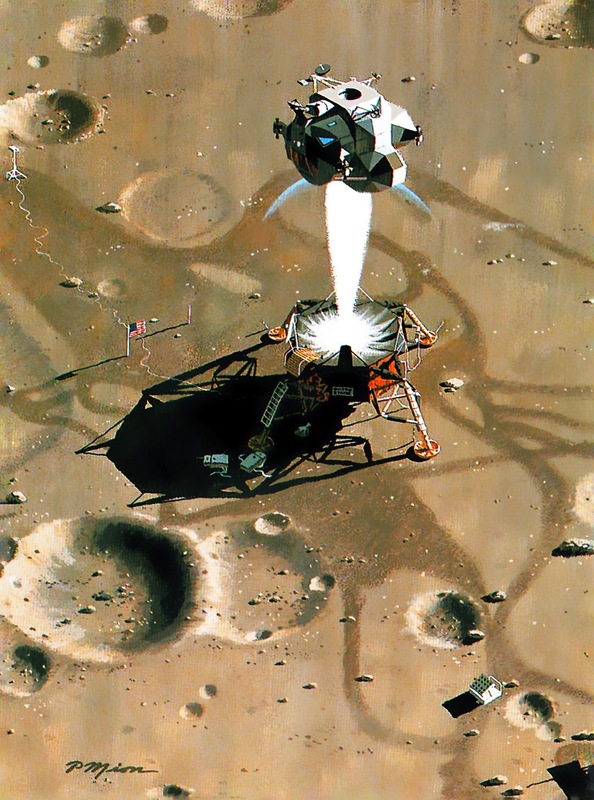 As we would have already jettisoned our Portable Life Support Systems, it would be necessary to use the OPS (Oxygen Purge System) we had retained to support the EVA that Evans would perform to retrieve film canisters from America’s Scientific Equipment Bay after leaving lunar orbit for home. The 8000 psi oxygen bottle in the OPS could provide a maximum of 30 minutes of oxygen and air-cooling once activated. There would be no water cooling, however, without a PLSS. With the Challenger’s cabin depressurized, the winner of the integrity check contest would take one end of the pair of cables out the hatch and down the ladder and move to QUAD III where a battery could be accessed. He would then tear away the Kevlar covers and attach the color-coded pair of cables to the positive and negative terminals of a battery and then return to the cabin. At the optimum liftoff time for ascent into a rendezvous sequence with Evans, Cernan would attach the cables to two circuit breakers near his left shoulder. This action would supply instant power to the two sets of hypergolic (ignite on contact) hydrazine and nitrous oxide valves in the Ascent Engine. Once power reached these valves, they would open and lock open. With opening of these valves, a signal would go to the cable and bolt cutters. We would be instantly on our way into lunar orbit, still in an un-pressurized cabin, dragging our jumper cables behind us. 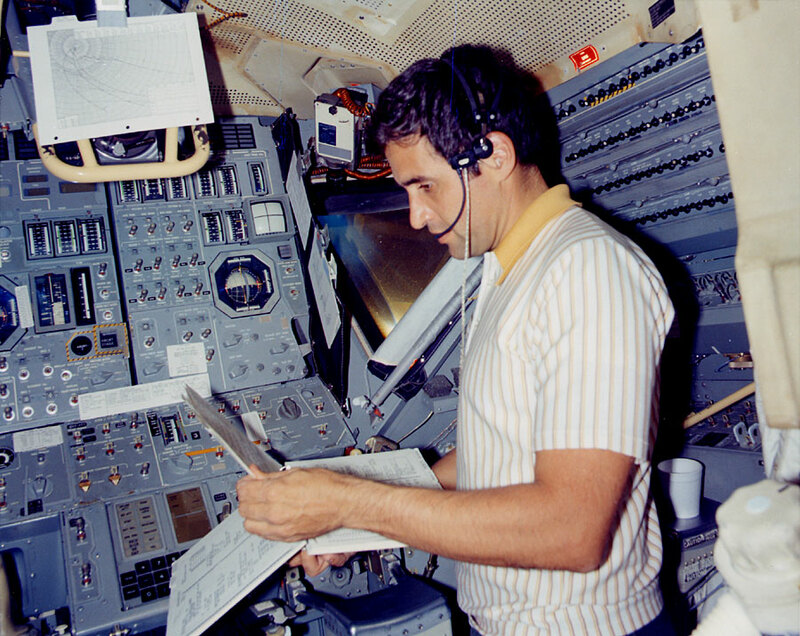 Once back in lunar orbit, we could clear and seal the hatch and pressurize the cabin. 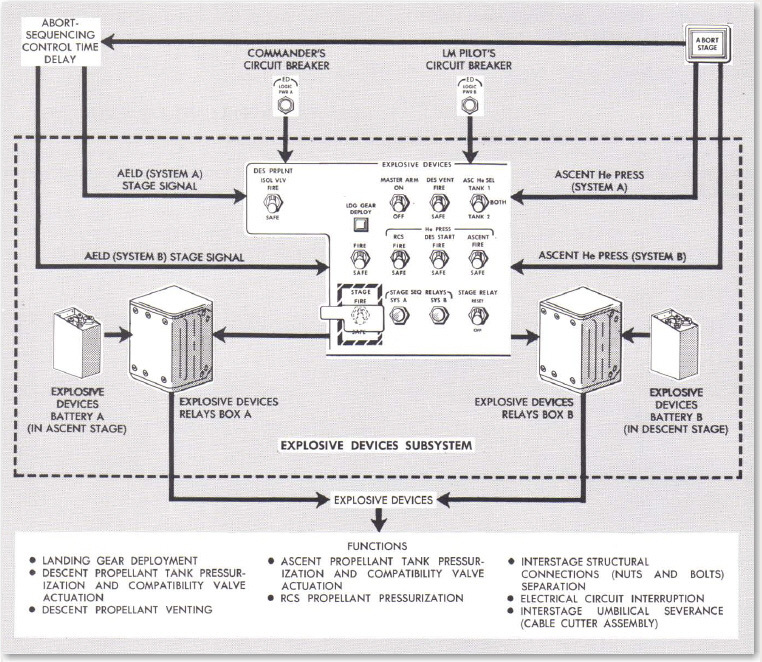 The aim of this emergency EVA was to bypass relay boxes, internal wiring, and the Explosive Devices control panel in order to get power directly from a descent stage battery. The descent stage explosive device battery, aka the pyro battery, in question was near the front, highlighted here. This procedure bypassed that in favor of a regular descent stage battery. 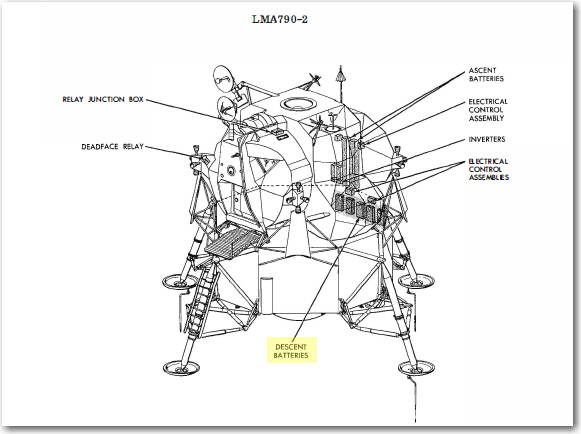 In later LMs, Apollo 17’s included, five descent stage batteries were at the back of the LM, shown below in an illustration from the Lunar Module LM 10 through LM 14 Vehicle Familiarization Manual [link to PDF]. Two of the five had low voltage taps; the jumper cable would be affixed to one of those. I’m glad they never had to do this, but it actually sounds like it would work. You might think, “Yeah, except for all the cardiac arrests and such”, but you have to remember that these guys were cool customers. Witness the fact that they practiced for this instead of climbing out of the sim and seeking the nearest bar posthaste when told of the method. Schmitt says this method was the “next to last backup”, which makes me wonder intensely what on Earth Moon the last backup was. Spit and baling wire? 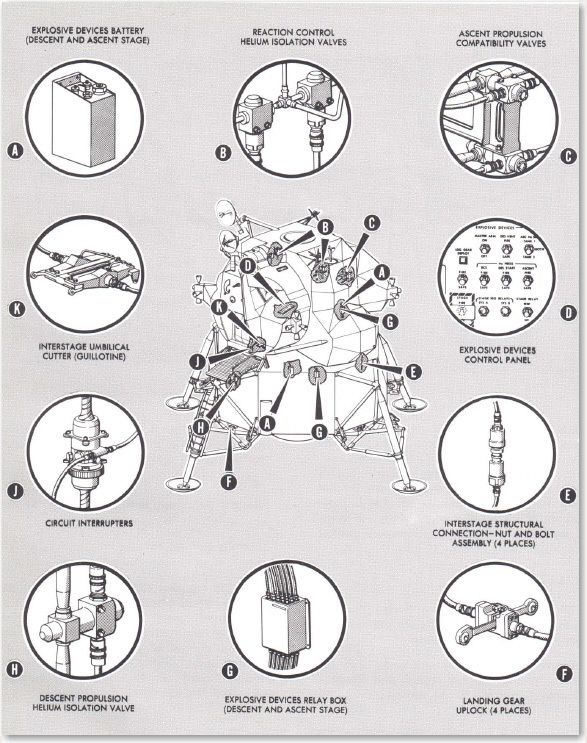 Edited 24 August 2018 to add: The entire emergency EVA procedure is detailed in Apollo Operations Handbook/Lunar Module/LM 11 and Subsequent/Volume II Operational Procedures, available on the Apollo Lunar Surface Journal site. See section 5.4.25 Loss of ED Sub-system. I think I found the answer to my “What’s the last backup?” question there: The other choice was to quickly get to the rover – in the case of Apollo 17, parked about 158 meters away for best liftoff camera coverage – start it up, drive it back to the LM, and hook up to one of its two batteries. Now that would really be a jump start for the ages, but I think far less preferable considering there was just 30 minutes of oxygen available in the OPS.